Built in 1838 by renowned locomotive pioneer Timothy Hackworth. Samson was shipped to Nova Scotia in 1839 by the General Mining Association (GMA) in the company of two other Hackworth engines, Hercules and the John Buddle. Also on board were engineer George Davidson and Hackworth’s shop foreman John Stubbs. Once landed, Stubbs prepared the locomotives for use and returned to England. Davidson spent the rest of his career running Samson on the 10 kilometer route from Albion Mines to the loading ground at the mouth of the East River where the coal was loaded onto ships for market. Samson spent its working life very near where it is now exhibited. The GMA locomotive shed was on the site now occupied by the museum. Samson ran coal to the loading ground from 1839 to 1867 and then was “semi-retired” as a shunter in the rail yard until 1883. By 1883 it was old enough to be a curiosity. It was taken to Chicago and exhibited at the National Exhibition of Railway Appliances and ten years later at the Chicago World’s Fair. Until 1927 it was at the Baltimore and Ohio Railway Museum when it finally came home to Nova Scotia. 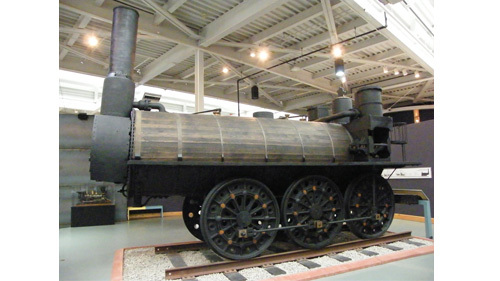 It was on display at Halifax and New Glasgow and came to its present home at the Museum of Industry in 1990.